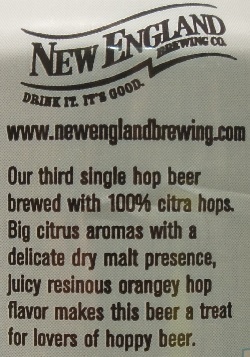 Category Archives: New England Brewing Co. Brewer Description: (from can) Our third single hop beer brewed with 100% citra hops. Big citrus aromas with a delicate dry malt presence, juicy resinous orangey hop flavor makes this beer a treat for lovers of hoppy beer. Intro: A 12 fl oz can with no canned on or best before date on it. Poured into a Lost Abbey teku glass. Appearance: A hazy orange colour with a nice two finger white head that had decent retention and left nice lacing. Aroma: Orange, mandarin, citrus rind, ripe mango, pineapple and grapefruit. Taste: Very nice juicy tropical and citrus fruits. Orange rind, mango, pineapple and pine with some nice sweet malt to balance. Bitterness is mild and restrained. Overall: Wow, just wow. This was just an amazing brew by NEBCo. A really really good IPA that is just up there with the best of them. I would love to drink this everyday. A must buy beer in my book.